The Progressive Conservative Party of Canada (French: Parti progressiste-conservateur du Canada) (PC) was a federal political party in Canada. One member of the Senate of Canada, Elaine McCoy, sat as an "Independent Progressive Conservative" until 2016. The conservative parties in most Canadian provinces still use the Progressive Conservative name. Some PC Party members formed the Progressive Canadian Party, which has attracted only marginal support. 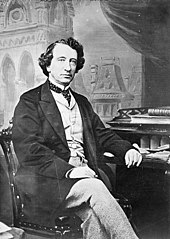 Canada's first Prime Minister, Sir John A. Macdonald, belonged to the Liberal-Conservative Party. But in advance of confederation in 1867, the Conservative Party took in a large number of defectors from the Liberals who supported the establishment of a Canadian Confederation. As such, Canadian conservatism has historically more closely resembled that which was practised in the United Kingdom and, to an extent, Europe, than in the United States. 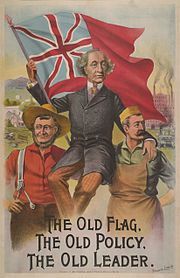 The "Tory" approach worked well for the party up until 1917, when, as was common amongst 19th-century conservative movements, Canadian Tories opposed the rollback of government intervention in social and economic matters advocated by the liberals of the era. In contrast to "American conservative" counterparts, however, they did not undertake as dramatic an ideological turnaround in the first half of the 20th century by continuing to follow mercantilism[dubious – discuss] and nascent notions of the welfare state. Red Tories tend to be traditionally conservative, that is, "Tory" in the Disraelian sense in social policy, placing a high value on the principles of noblesse oblige, communitarianism, and One nation conservatism—and were thus seen as moderate (in the context of classical economic thought) in their economic policy. For most of their history they were trade protectionists, engaging in free-trade economics in only a limited fashion, as in Empire Free-Trade. Historically they comprised the largest bloc of the original Canadian Conservative party. Notable Red Tories include John Farthing, George Grant, John Diefenbaker, E. Davie Fulton, Robert Stanfield, Dalton Camp, W. L. Morton, William Davis, Joe Clark, and Flora MacDonald. After a by-election defeat in 1942, a group of younger Conservatives from the Conservative Party of Canada met in Port Hope, Ontario, to develop a new Conservative policy they hoped would bring them out of the political wilderness. The participants, known as the Port Hopefuls, developed a program including many Conservative goals such as support for free enterprise and conscription. Yet the charter also included more radical policies, such as full-employment, low-cost housing, trade union rights, as well as a whole range of social security measures, including a government financed medicare system. Although many Conservatives rejected the charter, the charter still influenced party decisions. Delegates at the convention drafted John Bracken as leader, who was not even a member of the party. Bracken supported the Port Hope Charter and insisted the party register this policy shift by changing its name to the Progressive Conservative Party. On May 31, 2003, Peter MacKay won the party leadership after securing the endorsement of controversial fellow leadership candidate David Orchard, an outspoken opponent of free trade who wanted to return the party to its traditional economic nationalist roots. Orchard's endorsement of MacKay was predicated on four bullet points laid out in the Orchard-MacKay agreement, one of which expressly forbid the merger of the PC Party of Canada with the Canadian Alliance. However, after only a few short months as party leader, MacKay reneged on his promise and proceeded to negotiate a merger with the Alliance, which he announced had occurred on October 15, 2003. The two parties, so it seemed, united to form a new party called the Conservative Party of Canada. The union was ratified on December 5 and 6 in a process conducted by each of the parties, and the new Conservative Party was formally registered on December 7. The merger prompted Clark to remark: "Some equate it to a death in the family. I regard it rather as a death of the family." On March 20, 2004, former Alliance leader Harper was elected leader of the new party and appointed MacKay as his deputy. Following the merger, a rump Progressive Conservative caucus remained in Parliament, consisting of individuals who declined to join the new Conservative Party. In the House of Commons, Joe Clark, André Bachand and John Herron sat as PC members. In the 2004 election, Bachand and Clark did not run for re-election, and Herron ran as a Liberal, losing to Rob Moore in his riding of Fundy—Royal. Scott Brison, who had joined the Liberal caucus immediately upon departing the Conservative Party, was reelected as a Liberal in the 2004 election. After being expelled from the Conservative Party caucus in June 2007, Nova Scotia MP Bill Casey designated himself as an "Independent Progressive Conservative". In the Senate, William Doody, Lowell Murray and Norman Atkins also declined to join the new party, and continued to sit as Progressive Conservative senators. On March 24, 2005, Prime Minister Paul Martin appointed nine new senators, two of whom, Nancy Ruth and Elaine McCoy, were designated as Progressive Conservatives. Ruth subsequently left to sit with the Conservative Party. The death of Senator Doody on December 27, 2005, and the mandatory retirement of Norman Atkins on June 27, 2009, and Lowell Murray on September 26, 2011, left McCoy, the youngest of the five, as the sole Progressive Conservative in the Senate and the last sitting PC in either chamber of Parliament until February 11, 2013, when she chose to change her designation to "Independent Progressive Conservative". McCoy changed her designation to "Independent" on February 17, 2016, thus bringing to an end the presence of Progressive Conservatives in the Parliament of Canada. † Unofficial party status in Parliament. ^ Political Systems Of The World. Allied Publishers. p. 114. ISBN 978-81-7023-307-7. ^ "Senate of Canada". Parliament of Canada. Government of Canada. Retrieved October 16, 2015. ^ Perry Rand Dyck (2002). Canadian politics. Nelson. ISBN 978-0-17-616928-2. ^ a b The Essentials of Canadian History: Pre-colonization to 1867-the Beginning ... – Terence Allan Crowley, Rae Murphy – Google Boeken. Books.google.com. Retrieved on April 12, 2014. ^ "CBC – Canada Votes 2004". CBC News. ^ "globeandmail.com: Mulroney called Casey in bid for Tory unity". The Globe and Mail. Toronto. Archived from the original on March 2, 2009. ^ "MCCOY, The Hon. Elaine, Q.C., B.A., LL.B." PARLINFO. Archived from the original on April 2, 2016. Retrieved March 19, 2016.